Born and raised in Vietnam, I have known Wing Chun as “Vịnh Xuân” which carries the same meaning of “eternal spring”. However, my knowledge about Wing Chun was limited. I assumed that it is just another Chinese martial arts with fancy moves but not applicable in a modern day situation. Not until recently, the Ip Man movie series ignited my interest in Ip Man and the history of Wing Chun. I came to find out that Wing Chun is a martial arts that emphasizes in realistic defense, economic motions, and bodily structure. Since Wing Chun was initially developed for women, it focuses on “getting the job done” rather than fancy flying kicks or breaking wooden blocks. It uses body mechanics with minimal movements to simultaneously strike and defense. I have always wanted to improve my health, strength and overall wellness. However, like many others, I failed to stick with the mundane routine gym workouts. I knew at that time that I need to make a change. I wanted to do something that is interesting and beneficial for my health. The combination of my personal goal and interest in Wing Chun leads me to look for a Wing Chun school in the area. My first impression of Tampa Wing Chun Kung Fu is the dedication and friendliness of the instructor, Garret Brumfield. He took the time to explain the basic moves and concept of Wing Chun, helping the students to have a better understanding of Wing Chun. He created a friendly environment, which is built upon the enthusiasm of Wing Chun and the respect for each other. Over the past year, my strength and health have improved significantly due to Wing Chun. Garret has always pushed me to work harder not just in Wing Chun technics but also other aspects such as strength, cardio, and endurance. While I have never trained in any form of martial arts previously, I have heard many stories about bad experience with martial arts schools. Many schools focus on pushing students through the systems for financial reasons. Students from those schools can quickly earn a black belt in relatively short amount of time. However, they quickly forget what they learned or don’t know how to apply in real life situation. The students are left little training and most importantly with a false sense of security. In my opinion, it is more dangerous to over confident about your ability to self-defense. 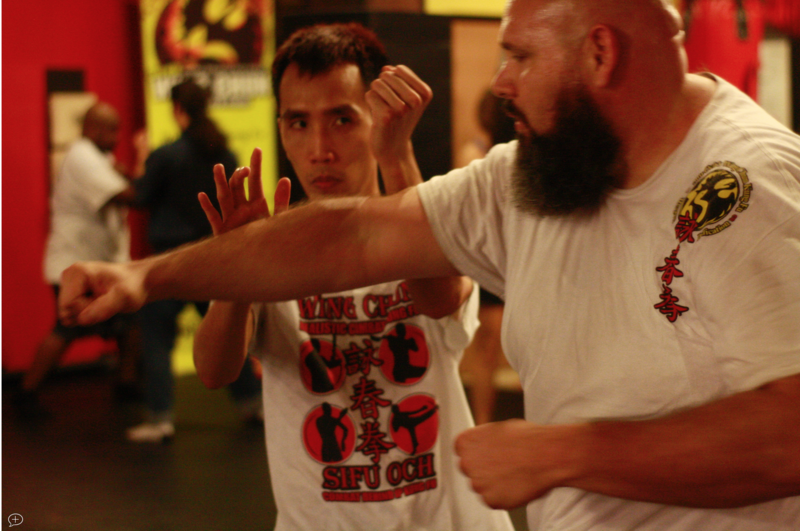 Unlike many other Wing Chun schools where they focus chi sao but little in real life situations, the curriculum of Sifu Och Wing Chun is detailed and vast in techniques. Sifu Och Wing Chun emphasizes on basic techniques and teaches students to be efficient in attacks and defenses in realistic scenarios. The curriculum is built to ensure that the students can master the techniques through constant repetition and deep understanding of the concept. Sifu Och, who has traveled the world and trained under many direct lineages of Ip Man Wing Chun system, has distilled his knowledge to a curriculum in which the best of traditional Wing Chun meets self-defense technics and even other forms of martial arts. Finally, Tampa Wing Chun Kung Fu and Sifu Och Wing Chun not only have helped me physically but also mentally. Garret and others have motivated me to keep coming to class even at the times when life gets in the way. They helped me to build up my discipline and determination to make a change and improve my overall well being. At the end of the day, there is no substitution for dedication and time to mastery in Wing Chun or anything else in life. I am glad and very grateful that I have found Sifu Och Wing Chun and Tampa Wing Chun Kung Fu. It has had a positive impact in my life. ← Tampa Martial Arts: Dixon K.